The school distributed the food to deserving family's. Hors D’Oeuvres and soft drinks, Cash bar. 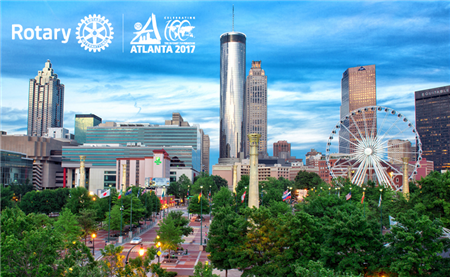 Rotary brings together a global network of volunteer leaders dedicated to tackling the world’s most pressing humanitarian challenges. Rotary connects 1.2 million members of more than 34,000 Rotary clubs in over 200 countries and geographical areas. Their work impacts lives at both the local and international level from helping families in need in our own communities to working toward a polo-free world, and the Gift of Life program for children’s heart operations. Locally our club supports Autism Speaks, Big Brothers & Sisters, a clean water medical project in Haiti, The Outreach Food Project to support the Inn in Hempstead, The Backstreach people at the Belmont Racetrack, and many other Humanitarian projects. Please bring a nonperishable food item for our Thanksgiving baskets. Meet at the garden bed dedicated to Keith Fairben who died on 9/11 in front of the rose gardens on Raff Ave. The Reverend Lars Silverness is a chartered member of the club. The club was chartered on August 3rd, 1955 so he has been attending for 61 years. That's a heck of a long time! Congratulations to Lars and his bride Natalie! Rotary International has published the themes for each of the next twelve calendar months. Want to know what they are? 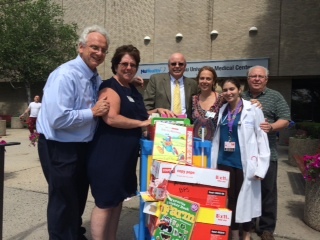 June 14, 14 Dropping off 0-5 year old children's books at Nassau University Medical Center for literacy project. Left to right, Rich Burgess, Linda Walsh, Jim Groom, Dina Lieser, Samira Nazzar Romero, and Tom Reilly. During the recent Belmont Street Fait we were approached by Dr. Samira Nazzar Romero seeking assistance with an ongoing literacy project at the Pediatric Clinic at the Hospital. The clinic is run by Dr Dina Lieser and is assisted by Linda Walsh. John Beyer for Men ON the Move contacted Mary from Book Donation Connection who was instrumental in providing a number of books for this cause. We thank Mary and John for their support. Please visit www.bookdonationconnection.org for more information on the fine work they do. The next meeting is July 15. This is a BBQ at Rich Burgess’ home at 107 Birch St, Floral Park. At this meeting there will be special awards presented as well as the induction of new Officers for the upcoming Rotarian Year. Please do you utmost to attend this meeting. You may e mail me at tomreilly2@excite.com or call 516-817-9259 so we have a head count for food. At the Belmont Street Fair we were selling chances for an IPAR air. The day turned out to be very successful selling over $1600 in tickets. At the Fair we meet Samira Nazzar. She is a Resident Doctor at Nassau University Hospital. She is from Columbia and was a member of Rotoact in Collage. She asked us if we could assist in the Hospitals Literacy project. They are looking to distribute 7000 books for children aged birth thru 5 years. I have been in contact with the district and they do have a number of books we can bring to the hospital. Anyone willing to assist please let me know. During the Parade, Shane Prouse, Rich Burgess and myself aided by Ron Keats, from the Keats Insurance Agency gave out 300 stickers to the children along the parade route. Thank You Ron for your help. During this meeting we discussed raising funds for BEST. We have been approached to assist in raising $4000 for a medical clinic at Belmont Race Track. This clinic is for the workers that take care of the horses and have no medical insurance and need to travel long distances care. We held a Networking meeting at Fiore Restaurant that had a very good turnout. No business was conducted. Insufficient attendance. During this meeting we discussed the cash awards for the village schools and BEST project. Guest speaker is Maribeth Pietropaoli. Maribeth is Vice President, National Sales for ZTITLE. Her company is an agent for three of the largest Title Insurance Companies, Fidelity, Stewart, and First American. ZTITLE is owned by 23 partners who are involved in Insurance, Financing, and Real Estate Management. She further explained the title process and being a client advocate through the process. Dictionary Distribution to John Lewis Childs and Floral Park-Bellerose Schools. John Day, Shane Parouse and Myself distributed over 300 dictionary’s to the third grades at both schools. During this meeting we put labels into the dictionaries being distributed to the third grade students. Also discussed was the upcoming Best project. Guest speaker at this meeting is Michael Breitman. Michael discussed attending his recent convention of Action Coach. At the last meeting there were usual number of members present. While membership is increasing members at the meetings are decreasing. We discussed various incentives to boost attendance and have now come to a decision as yet. If you have any suggestions or ideas please let me know. We are attempting to increase the guest speakers and are trying to attract speakers that would be of interest to all of us. At the next meeting Shane Prouse will be speaking about the book "Where Winners Live" which will be enjoyable. Also please look at our web site. Under DOWNLOADS there is a fantastic article I posted that was in the Gateway of Shane Prouse running in the NYC Marathon and the funds he raised. We have also contributes funds to the Philippine Relief Fund. The next meeting will be on Dec. 10, at Trinity Restaurant at 5:30. Please be on time. The meetings are starting and ending later and later. One of the things discussed is a $5 fine for lateness. While this has not been put in place it can be avoided if members are on time. I will publish the guest speaker in advance of the meetings so you can plan accordingly. One final note. I see how many have logged on to our web site, which has only been a few. If you need your user name/password please don't be shy asking me for it. There is important information and news there for you. At our last meeting we inducted Kathleen Sottile as a new member. Kathy is the Principal, at Floral Park Memorial High School. We currently have three other prospects that have been approved by the membership to be installed in the next few weeks. Belmont Family day is coming along well and final plans are just about set. Please try to attend this fun filled event. At our next meeting we will be visited by Gwenn Ramage, District Governor. Please attend so we have a good turnout. At our last meeting we were presented with a fantastic video. Ashley Carlo from the Cancer Center for Kids did the presentation. 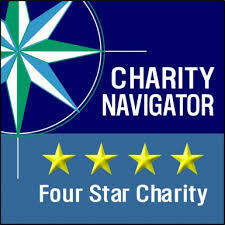 The organization provides support to children with cancer and their families all through donations and volunteers. I have sent a separate e mail with their link and ask you to review it. We have also had five guests for diner all of which have shown interest in becoming members. Belmont Family Fun Day is well on its way. I have sent separate e mails about this event. We can always use more people on the committee. If you are so inclined please contact Dom Longobardi at 516-353-4032. At our last meeting we had Michael Star as a guest speaker. Michael Starr is a former Marine who has trained Marines in hand-to-hand combat and special tactics. He touched on subjects of how to address a threat, being prepared and self reliant and having confidence in your own abilities. Please visit his web site at: thinkselfprotection.com. Results of the fund raiser are still being tabulated. Save the date---Oct. 13, 2013--- (Sunday) Rotary Family Fun Day at Belmont Raceway. More to follow. As you are aware, we began a fund drive for the Sisters from Harvest House to assist them in repairs to a chair lift for one of their adult homes. We committed ourselves to raising the $2500 needed to repair a chair lift at one of their adult living facilities. Through a raffle, collections, and a very generous donation from one of our members we met that obligation and added much needed funds to the treasury. We were receiving tickets up to the meeting date, so final total on monies received is still being calculated. I will have the figure for you in the next news letter. The winners of the raffle are the Groom Family (I Pad) and the Mooney Family (Nook). Photos will be published as soon as I can get them on the web site. The plan for the Rotary-Belmont Family Fun day is progressing well. The plans will be finalized in the next two to three weeks. Thus far there will be free parking and free admission to the park. We will have the use of the Marquee Tent during the event. Further details will be forthcoming. On a final note, Bill Harris has resigned as a member. We wish him well. We are now at 18 active members. 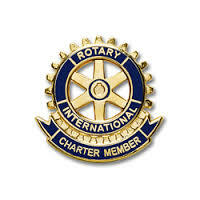 Our hope is to increase membership to 40 by the end of the Rotarian year. We can all help in this respect by asking neighbors, the merchants we deal with every day, etc. to attend one of the meetings for an informal introduction to the club and experience the good work we do for the community. At the Tuesday meeting your officers for the upcoming year were sworn in. The induction was conducted by past President Richie Mooney. Past District Governor Robbie Donno was present. Robbie spoke about his experience with the Gift of Life Foundation. He spoke about his first encounter with one of the recipients with this life saving operation. He provided us with a very powerful and moving recollection of the recipient’s father. I could not do him justice by trying to relay his message. You would have to be there to understand his feeling for this program. Our goals for the next year sound simple but will need the assistance or each and every one of us to achieve. First is to increase membership to forty. At present there are 19 members. In this respect we all can bring in new members or ask a potential member to attend as our guest. Second is to get our signature project off the ground. This is a Rotary-Belmont Family day to be held in early October 2013. If this is successful will be an annual fund raiser for us. In closing two reminders semi-annual dues are now do. And second the raffle is on July 4th. Please get your tickets in by July 2nd. I have more ticket if you need them. You can send you checks to me or if necessary I will pick them up. They both won the senior award contest for their essays “Service above Self”. They are both well spoken adults and a credit to our community and their parents. Also in attendance was Mario Moran, District Governor, who presented us with a Presidential Citation for actively working to achieve peace through service. Our guest speaker was Tom Scarda and his wife Gina. Tom gave a very informative talk about keeping motivated and the importance of setting goals and keeping to the plan to achieve them. This was followed by a very interesting discussion. We are in the process of doing a fund raiser. We are selling raffle tickets for and I Pad which was donated by Tara Morano of Abbott Reality and an HD Nook donated by Teresa Reid of Daniel Gale Reality. So far we have collected more than $1,000 and have met our commitment to Harvest House and raised $2,500 for them. This was only possible due to an anonymous gift made by one of our members. I have the raffle tickets, and will be mailing to each of you this week 10 tickets. Please do your best to sell these tickets since the treasury is in a great need of replenishment. The tickets are $5.00 each or 5 for $20.00. If you need more tickets you may contact me and I’ll get them to you. Either mail the tickets back to the PO Box or call me and I’ll be more than glad to pick them up. But the best way is to bring them with you to the next meeting. Please return the tickets as soon as possible since the drawing is on July 4th. Finally I will also be mailing out forms for you to review and return to me so I can bring the records up to date. Things do change i.e. Address, phone numbers, contact numbers, etc.. This will give me a path to send you your records on occasion as to attendance and keep you informed as to club events. This Sunday the Rotary Club of Floral Park-Bellerose will be participating in the Floral Park Chamber of Commerce Street Fair, the day after the "Belmont". Tara Moreno, has donated an IPad and Teresa Reid a Nook to be our prizes for our club's latest fund raiser raffle. Drawing date July 4th. All Rotary members are asked to come down to the Fair and help sell raffle tickets. We will be sharing a booth with Abbott Realty infront of their store on Tulip Ave. Hours are 2pm to 7pm. Thanks! Increasing membership - Although Teresa is the chair of this committee we all have a commitment to this end. We all deal with the gas stations, delis, cleaners, friends and associates, etc., on a daily basis. 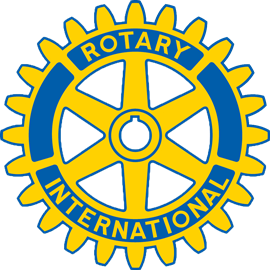 Why not ask if they know of Rotary and would like to attend an informative meeting? Signature project- creates awareness in the community of the club and annual fund raiser through a Rotary/Belmont Family day to be held the first weekend in October at Belmont Race Track. Interact Club- There is several students from Floral Park Memorial High School that want to start this club. They have been discussing this with Rich Burgess. This is a fantastic way for the youth to become involved and engaged in a meaningful way in their community. Seed money will be needed to support the students in this endeavor. Belmont Street Fair- Tara Moreno of Abbot Reality is providing us space at their booth to sell raffle tickets for an IPAD. We need people to assist at the booth for an hour or two during the event. Please spend some time with us for this needy fund raiser. Everyone is encouraged to provide suggestions and to join one of these committees. In closing, we received a letter of heartfelt thanks from Sisters Mary and Jean, of Harvest House, thanking us for club our donation and that of the members who contributed so generously. They are close to their goal of $2500. There will be more information to follow for all upcoming meetings and events. We had a number of guests at this week’s meeting, so let’s get to it. Two of the three Rotary Youth Leadership Award (RYLA) sponsored high school juniors were in attendance – Armaan Shah (a Sophomore from New Hyde Park High School) and Anna Christ (a Sophomore from Floral Park Memorial High School). Both Armaan and Anna gave a summary of their weekend at the RYLA conference and told the club that it had changed their lives for the better. Armand was accompanied by his mother and Anna by her parents Gwen and Doug. We look forward to hearing good things about Armand and Anna in the future. Also in attendance were Jake Dertinger and Mikael Guarini, two Juniors from Floral Park Memorial who have been speaking with “New Generation Committee Chairperson Rich Burgess with regard to starting up an Interact Club at the High School. The speakers for the night were Sister Mary and Sister Jean from Harvest House. The Sisters spoke to us about Harvest House which provides housing for the elderly. Harvest House provides a home for eight independent elders (65+) who want the fullness of living in a family atmosphere. Harvest House provides quality of life, companionship, support, security, gracious living, meals and private rooms for an affordable price. Currently, Harvest House maintains houses in Lake Grove, Syosset and Floral Park. Sister Jean was asking Rotary’s help in providing funds for fixing a chairlift in one of their houses for a total cost of about $2,500. President Shane Parouse then asked club members and visitors to donate their “Happy / Sad Dollars" towards helping to fix this chair lift. By the end of the meeting, the Club had pledged $428.00 towards effecting repairs to the chairlift. Many thanks to all Rotary members with a special thanks to Rich and Liz Burgess and the Bellerose Village Fire Department (Doug Christ). Great Job! Rich Burgess, New Generation Committee Chairperson handed out information on what New Generation and Rotary are all about. Please check the website for more information. In an effort to simplify access to our website, we have changed the website address. In the future, please use this address to access our website. At this past Tuesday’s meeting, we inducted a new member to the Rotary Club of Floral Park-Bellerose – Ms. Tara Moreno. Tara was officially inducted by Past President Rich Burgess. Tara is a Licensed Real Estate Broker and is the owner/broker of Abbott Realty, located at 150 Tulip Avenue, in Floral Park. Abbott Realty is the one of the most successful independent residential real estate brokerages in western Nassau County, in no small part due to the determination to combine state-of-the-art computer technology with old-fashioned service and integrity. Abbott Realty has received recognition from Forbes by winning the prestigious Forbes® Enterprise Award in the category of Real Estate for Long Island! And, this year, Abbott Realty celebrates it's 30th anniversary of being in business. Tara, congratulations and welcome to the club! Our guest speaker was Floral Park’s Mayor Tom Tweedy. Mayor Tweedy spoke about Floral Park’s response to last year’s storm – Sandy. Tom spoke about how he was impressed by the quick response of Village employees in clearing the many fallen trees throughout the village. Tom also informed the club that many of these fallen trees was then used in the making of plywood which in turn has been used in the rebuilding of many of Long Islands effected houses and businesses. The tree stumps that were collected were also used to help with beach erosion around Long Island as well. Tom also spoke on a personal level of how he is proud to belong to the Floral Park community as he witnessed many friends and neighbors throughout the village, helping each other during this 2-3 week period. Note: Our next regularly scheduled meeting - Tuesday April 23rd - is being cancelled in lieu of the upcoming Wine Tasting with Friends night at The Village Wine Cellar which is scheduled for Thursday April 25th beginning at 5:30 pm. See the information flyer under Club Events for details. Tuesday, March 26, 2013 @ 5:30 p.m. Please come down and join your friends, relax with a drink and some fine food and get to know your fellow Rotarians and business friends. Shane Parouse welcomed a couple of guests – Rachel Thorner and Dennis Hooper to our meeting. Rachel is a student studying Russian studies who has worked in Moscow and Israel as a Russian linguist. She is looking forward to furthering her education and is currently seeking opportunities to do so. Our featured speaker of the night was member Ashok Mathias, owner of Village Wine Cellar - www.villagewinecellar.com/. Ashok, who is an accountant by trade spoke about “Wine and Taxes”. Ashok gave us a brief tutorial on the history of wine making and its origins as well as the making of reds and whites! Ashok also identified a few ways to save on your taxes which sparked a spirited exchange of ideas amongst everyone in attendance. Thanks Ashok. Please feel free to invite as many guests as you want. See you there! Photo: Rotary President Shane Parouse swears in Ashok Mathias as the club’s newest member. The Rotary Club of Floral Park-Bellerose’s mission is service above self. The Club, chartered in Floral Park in 1955, meets every second and fourth Tuesday night at Trinity Restaurant. To learn more about the club and to come as a guest, contact President Shane Parouse at shane55@yahoo.com or 646-528-7570 or visit the club on facebook. The Rotary Club of Floral Park - Bellerose is sponsoring a blood drive on Thursday December 27th, 2012 from 2:30pm to 8:30pm. On Sunday 09/30/12 Teresa Reid, Jim Groom, Bryan Smolarz, Rich Burgess and Tom Reilly had a good time selling raffle tickets at Associated Food Store. We set up a table in Associated's rear parking lot and prominently displayed a Rotary Raffle Banner which was donated ($200 printing cost) by Bryan.. We worked from 7:30am to noon selling many tickets and even received donations.. Total proceeds: $708.38. Awesome.! Congratulations and thanks to all particularly Teresa who is chairing our Raffle project. Please keep selling your raffle tickets and bring your ticket stubs and cash to our dinner meetings up to 11/20/12. Drawing for the Ipad, child's bike and acoustic guitar will be held on Thanksgiving. So our next dinner meeting is on 10/09/12 at Trinity's. See you then. Tonight one of our newest members, Sal Valente, VP of Valente Bakery Ingredients, Maspeth, Queens, NY gave us terrific talk about his business. Sal has amazing passion for this 4th generation food distribution business started by his Grandfather. The business succeeds because of fantastic service and a love of the people they serve. Thanks Sal! We also distributed Rotary Club of Floral Park-Bellerose raffle tickets for sale by all. Proceeds will go to funding projects to assist children and help returning Veterans acclimate back to society. Raffles are $5 per ticket and five for $20. Also there is a luncheon meeting being sponsored by the Floral Park Chamber which will take place Thursday, September 6th, 2012 from 12:00 noon to 2:00 pm at Stella Ristorante, 152 Jericho Turnpike, Floral park, N.Y. 516.775.2201 This will be a good chance to network with members of the Chamber. Please check out our website for further details. There also appeared to be some confusion for some other members as to where the meeting was. For the foreseeable future, while we are looking for a permanent home for our meetings, all Rotary meetings will be held at Trinity Restaurant at 5:30pm on the 2nd and 4th Tuesday of every month. An email will be sent prior to every meeting confirming the time and place of each meeting. You can also check our website for this information as well. Our September meetings are scheduled for September 11th and 25th. If there are any changes, members will be notified as soon as possible. Greg Kramer and Shane Parouse inducted two new members into the Floral Park-Bellerose Rotary Club: Michael Breitman, a Certified Business Coach and Sal Valente, owner of Valente Bakers Ingredients. Michael and Rich Burgess have volunteered to coordinate speakers for the 2012-2013 Rotary Year. Sal and Michael have agreed to be speakers down the road so they can give a run down on their occupations. For next week, Michael has secured Linda Sweeney to be our speaker. Linda is involved with development at Winthrop University Hospital as well as the hospital’s Cancer Center for Kids. The meeting will be held at Trinity’s Restaurant in their back room. Again, WELCOME to Sal and Michael! We are very pleased to have you as members of the club! April 24th Dr. Lynn Pompbonyo gave us run down on our local elementary school district. May 8th, Mark Reisig spoke about his Regional VP position at Arch Insurance Group which was most interesting and we thank him! May 22nd, Greg Kramer's son Jonathan, a junior at GCHS provided an excellent speech on organ donation. May 30th, we had our inaugural Rotary Happy Hour at Koenigs where Greg Kramer inducted Dom Longobardi into the club. Special thanks to Dom for covering the cost of the food. Awesome! Dom works for the Town of Hempstead as head of Sanitation and is a Trustee with the Village of Floral Park. June 12th, we started the meeting inducting our newest Rotarian, Teresa Reid, Community Relations Manager, Barnes & Noble. The rest of the meeting was dedicated to our local youth. Susana Lyons-Kiang and her Mom, Peggy Lyons and Michael Nelson and his parents, Ken Nelson and Phyllis Nelson where with us. Susana and Michael are sophomores at FPMHS and attended RYLA this past March. Both had a great experience and thanked us for sponsoring them. Also from FPMHS was senior Victoria (Tori) Boell our Rotary Club Student Award Winner for 2012 who wrote an excellent essay on “Service Above Self”. She was accompanied by her Mom Susan Boell. From Sewanhaka High School Nancy Agyeman-Duah was with us as the 2012 senior “Service Above Self” Rotary Award Winner. She was joined by her mom Catalina Agyeman-Duah. Both of our senior winners spoke of their future plans; with Tori wanting to become a music teacher and Nancy a nurse. Both young ladies emulated the values of service to others and we are very pleased to recognize their accomplishments. Also, over the past few weeks our club gave out three 8th Grade Rotary public speaking awards to Joseph Frank LoGrippo, John Lewis Childs School, Thomas Epstein, Floral Park-Bellerose School, and Timothy Wolff, Our Lady of Victory School. These showings of the film, "Flag of My Father" on June 4th and June 7th in Lynbrook, support the critical Operation Initiative Guide Project for returning and returned veterans to help them reenter their communities. A successful event, especially at the UA theater, will enable Rotary to show this important film in UA theaters throughout the US and will have a huge impact on veteran support. Here is the film background information, and the showing information is in the attached Flier. Hope to see you in Lynbrook as part of the important support to our retuning service men and women. Dominick A. Longobardi, Floral Park Village Trustee, has expressed interest in joining our club. His occupation is Assistant to the Commissioner of Sanitation, Town of Hempstead. This announcement will serve as notice to all members. If any member has an objection to his application, please notify Jim Groom, Secretary by May 1st, 2012. Thank you. Last night we are very fortunate to have as our guest speaker Dr. Lynn Pompbonyo, Superintendent of Schools for the Floral Park Bellerose Elementary School District. Dr. Pompbonyo gave us a terrific update on the school district which we see is in very good hands. On February 28th we had Donna Rivera - Downey give us a rundown of international Rotary youth exchange programs and on March 15th we joined the Rotary Club of Flushing's meeting at Gino's hearing about Terrorism and the Media. Coming Up: Next week's meeting, March 27th, Shane Parouse will be giving a, no doubt amazing, talk about his a lively-hood as well as an update of what he learned last weekend at the President's Training Session in Islip. Shane filled in for our President Elect, Greg Kramer who was unable to attend last weekend. On April 10th our speaker will be the executive director of the Queens Farm located in Floral Park. On April 24th Dr Lynn Pombonyo, Superintendent of the Floral Park-Bellerose School District will be speaking about the elementary school's state of affairs. Also, Dr. Lynn is interested in our commitment to provide dictionaries to all her third grade students (208). The personalized dictionaries for each child will include their name, a message from Rotary and our “Four Way Test”. We will need help putting them together at one of our upcoming meetings. We will shoot to have this project completed in May. On December 13th our speaker Michele McCaffrey, from the LI Blood Center kicked off our meeting and we made some plans for our upcoming blood drive. Jim Groom gave us a rundown of our new website: www.clubrunner.ca/floralpark-bellerose and we thanked him for inputting content to get the site looking sharp. Please visit and provide feedback and ideas. As the evening progressed Greg Kramer and I pulled out our guitars and we all sang a couple of Christmas tunes. Our guests were Elsie and Patti Kennedy, Beth Kramer, Gabriella Smorlaz, Dorothy Pelligrini and Norine Grodin (Long Term Care Planner). Thanks to Tom Reilly for keeping track of the meal money and a special thanks to Rich Mooney for a $400 contribution to fund two FPMHS sophomores (boy & girl) to attend RYLA next March . Rich was not in attendance given he was celebrating his wedding anniversary but he sent lots of happy dollars. Nice. Take a friend to a Mets game and save lives! At this time of Thanksgiving it is gratifying to see the increased momentum the Rotary Club of Floral Park-Bellerose is experiencing as we strive to serve those in need. This week we welcomed Mark Reisig as our newest member. He attended our Club Assembly earlier this month and was active in the club's discussion to take on two major projects. Hello everyone! I think everyone has been pleased with the wonderful reception we have had from Bob's Place Restaurant, 230 Jericho Tpke., Floral Park, NY. Thank you to proprietor, Bob Manning, for the great food & service, with a great price. Bob has expressed interest in joining the club. The Fall officially started this past week and like nature our club is compelled to enter a new season and move on. We have meetings coming up which will require slide and power point presentations which ideally would be best served in a dedicated room. Bryan Smolarz did some investigative legwork and with majority (phone) concensuss we are going to move the next two meetings to Bob's Place Restaurant, 230 Jericho Tpke., Floral Park, NY. Bob's can provide us a private meeting room with dinner at a cost of $19 for three entree choices, soda/seltzer, dessert, coffee, and it includes the tip. If after the two trial meetings we decide to officially move our meetings to Bob's, we will keep our price at $20 with the extra dollar going towards the Rotary Foundation. In this way our club can meet DG Gabor Karsai's challenge to achieve 100% club member participation with the Foundation. As summer winds down we hope everyone did well surviving Hurricane Irene and perhaps having one last visit to the beach to catch some sun. Last month the club took on some new initiatives by reaching out to help returning veterans and in also having our first Floral Park-Bellerose Rotary Business Card Exchange. We held our Networking Event at Fiori Restaurant. Turn out was fantastic. There were over 20 in attendance. We were glad to see members from the Elmont-Franklin Square club who also attended. We also inducted a new member Maribeth Pietropaoli. Maribrth is VP, National Sale Executive, at Zodiac Title Services. On Wednesday Jan. 15th Floral Park Memorial Interact conducted their first meeting. There were over 20 in attendance. A very good turnout for a new club in the High School. As part of our sponsorship for this club a Rotarian must be in attendance. Rich Burgess and I were there. I ask that any member who has some time to assist in meeting our requirement to signup. The next meeting will be on Feb 5th at 3PM. I will be in attendance and ask if anyone else would like to join me. To see the enthusiasm exhibited is fantastic. This is nothing like the subdued meeting we have. There will be changes made to our meetings. They will now include a short networking event for 5 to 6 PM. with regular meeting dinner to follow to end at 7PM. We are looking for nominations to Officers for the club 2014-2015 Rotary year. I sent out two e mails and the second was in correct. Names mention were nominations of one member. Please e mail me the names of the people you would like to see in these posts next year. Open positions are President, Vice President, Secretary and Treasurer. My e mail address is tomreilly2@excite.com. Next meeting is January 28, at Trinity Restaurant at new TIME 5:00PM. See you then. At Our last meeting our guest speaker was Shane Prouse. Shane spoke about a book he recently read, "Where Hero's Live"
The book is about relationships in business and life. How to deal with associates/friends that may be difficult or not so difficult. What should be praised and encouraged, yet, dealing with actions that need to be addressed without being offensive. There was a lot more to the presentation which was fantastic. We also discussed having a networking meeting for the first meeting in January. You will be hearing more about that in the near future. To encourage better attendance we are attempting to find interesting speakers. Our goal is to highlight a member each month and guest each month. Also discussed was changing venues to maybe a breakfast meeting on occasion. As you know we are sponsoring an Interact club at Floral Park Memorial High School. Some of you have meet two of the Interact officers. Their first meeting will be next week, which I will attend and give your the details of the meeting. Our next meeting will be Networking. Please ask any of your associates to attend. At our last meeting Keith Cappuccio was inducted. He is sponsored by Shane Prouse. Belmont event went well. We made some money to be used for our Charities. Dom Longobardi did a fantastic job of organizing the event. Joanne, Community Relations Director from NYRA, provided a warm and friendly atmosphere and went out of her way to make this a special day for us. I would like to also thank John Day for the outstanding photos he took along with Shane Prouse. I receive a number of e mails from clubs in the district informing us of their events and inviting us to attend. I have invited all the clubs in the district to attend Belmont. Other than our members on one else attended. I will try to get the photos up on the web site as soon as I can figure out how to publish them. Next meeting is Nov. 12, at Trinity. I have asked the restaurant if they can do a Turkey diner for the following meeting Nov. 26. They need a head count for this since the Chef has to buy the turkey etc. This would include anyone you wish to invite to diner. It was pointed out to me this may be too close to Thanksgiving and maybe better in January as a Club Family diner. Please let me know at the next meeting or by e mail at tomreilly2@excite.com. Michael Breitman, one of our newest members was our speaker this evening. He gave us a run down of his career which spans technology, architecture, entrepreneurship, and consulting. Today Michael is a business coach working with CEOs, owners, and those in managerial positions enhancing their personal and business results with proven methods. One of his larger clients is Winthrop University Hospital. His consulting business is part of Action Coach a national chain. Here is Michael's contact information. Tonight at Trinity's President Shane Parouse announced Treasurer, Mark Reisig had his 6 year old daughter pull the winning tickets for our Thanksgiving Raffle. We have three winners and Shane will be contacting them to arrange providing the: IPad (donated by John Beyer; Men On The Move); Child's Bike (donated by Ron Keats; KeatsAgency.com) and the acoustic guitar (donated by Tom Attivissimo, Greiner Maltz Commercial R/E Brokerage). Our condolences to those who did not win. There is always Power Ball. Shane also announced we will be once again be having a Rotary Blood Drive two days after Christmas, Thursday 12/27/12, 2:30 to 8:30 at the United Methodist Church on Verbena Ave., Floral Park, NY. Michele McCaffrey from the LI Blood Services was on hand providing flyers, scripts, often asked questions/answers, and team sign up forms for our use in encouraging past and new donors to come and give blood. Shane asks all members to bring five people to the event as we would like to exceed last years numbers: Last year 79 people came and 68 pints were donated. District Governor Mario Moran who gave a short history of his background and what he hopes to accomplish this coming year in District 7250. Also attending the meeting was Frank Scaturro who stopped by to let the Club know that he is running for Congress this fall. You can read about Frank at his website: www.frankscaturro.com. Our next meeting is scheduled for October 23rd, 2012 at Trinity Restaurant at 5:30pm. Our next meeting on January 24th will be a presentation by the Red Cross. We asked District Governor, Gabor Karsai to join us and induct new members; John Beyer, President of Men on the Move, and Bob Manning, Owner of Bob's Place Restaurant. Please make every effort to attend this meeting showing support for the Governor.